A Pellet Stove offers the pleasure of coming home to, or getting up to, a beautiful pre-lit wood fire as well as being cheap to run and environmentally friendly. As with oil or gas home heating appliances, microprocessor computerised controls allow you to set the timer, control the heat output, or even text them (Rika, Ecoteck) when you want the heating on. 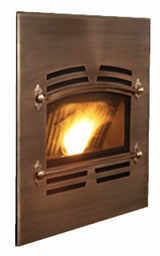 Modern wood pellet and corn heaters come in sizes and styles to suit most homes. 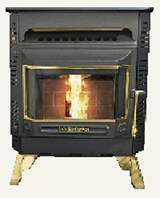 The best stove for you will depend on the area to be heated, and the budget available. Output ranges from 25,000 to 75,000 btu. More for furnaces and boilers. Glass viewing panels allow the warm glow of the fire to fill the room, and with an artificial log set to diffuse the flames, they can look remarkably like a traditional wood burner. 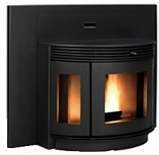 Stoves are available as freestanding, stove inserts for existing fireplaces and hearths, or pellet and corn central heating furnaces and boilers. Wood pellets and corn are clean, easy to handle and store, and are waste products from the timber and agricultural industries otherwise known as biomass. The amount of carbon they produce on burning is the same as the amount absorbed when the biomass fuel was growing, which makes the heat they produce carbon neutral. When the house is up to temperature the fire will go out until more heat is wanted, at which point the fire will re-light automatically. This efficiency gives economic heating and considerable energy savings compared with wood stoves or fossil fuels. Creosote and smoke can account for fifty percent of the fuel value in a normal wood burning stove. In pellet and corn heaters these wasteful by-products are burnt at higher temperatures resulting in less flue maintenance, diminished risk of chimney fires as well as better neighbourhood air quality. The small amount of ash remaining is about one per cent of the amount of fuel burnt. 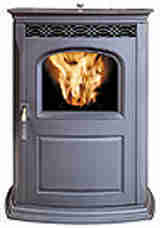 Generally, a pellet burning stove will need to be emptied about once a week. Being mineral rich, the ash can be spread as fertiliser. This tiny quantity of waste gives an indication of just how efficient these stoves are. How Does A Pellet or Corn Stove Work? A container at the back called the hopper holds the fuel. This is taken to the burn pot as needed to maintain the temperature the thermostat is set at. A controlled amount of air is fed to the burn pot from outside for combustion, and the heat produced is blown around a heat exchanger for circulation around the home. The spent gases are then blown out through the flue. Technically these appliances don't need a traditional chimney because they rely on blown air instead of heat convection. They do need to be vented externally. 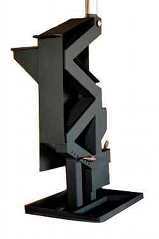 See the stove manufacturer pages for detailed specifications regarding each stove or fireplace insert listed. My standardised format for stove specifications makes it easy to compare individual stoves, even from different makers. For direct comparisons see the Comparison page.